Seaport Boulevard is seen during rush hour traffic on Thursday. A few months ago, the good people of the Seaport District began noticing something on their streets they never imagined: gridlock. While the morning commute is tolerable, everyone seems to head out at 5 p.m., creating bumper-to-bumper traffic along the main spine on Seaport Boulevard, spilling out onto Atlantic Avenue, and clogging side roads throughout the area. And the vaunted Silver Line? Its buses are sometimes so jammed during the afternoon rush that riders are forced to wait on platforms for the next one to come by. And just like that, one of the oldest problems vexing Boston is invading its shiny new space. 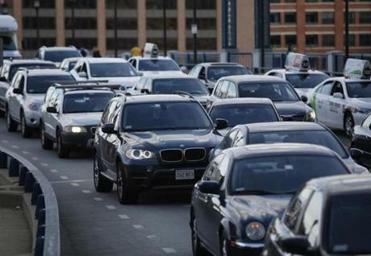 Read: Discuss: How would you ease gridlock in the Seaport District? 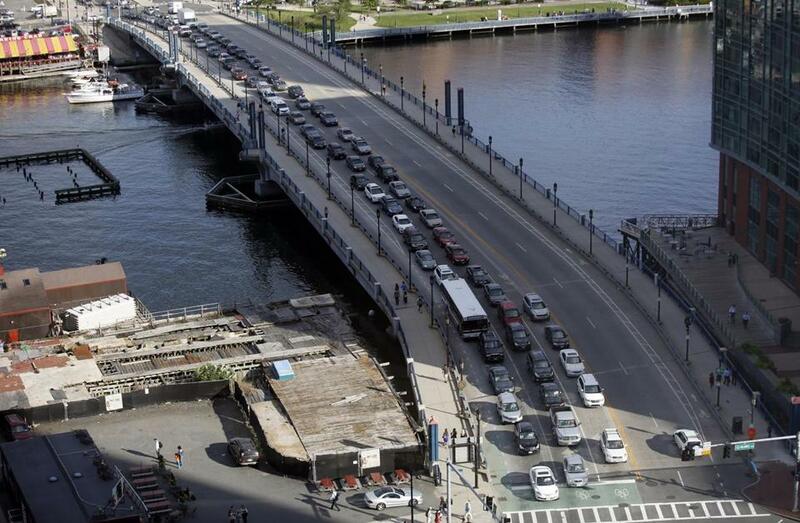 It may sound like a lot of whining — these rush-hour headaches are the norm for those in the Financial District and the Back Bay — but the South Boston Waterfront is growing so fast that officials are now realizing it is a transportation crisis waiting to happen. If you knew what they knew, you’d understand the sense of urgency. ■ The Seaport District has about 30 million square feet of development built or permitted. As Menino indicated, this amount of development was not supposed to happen until 2025, at which point the existing transportation infrastructure would reach maximum capacity. ■ If gridlock is bad now, wait until next year. Six major companies – including Vertex, State Street, PricewaterhouseCoopers – will begin to bring about 6,300 employees into the district over a three-year period. That’s on top of the 200 companies with 4,000 employees that moved there just over the past couple of years. ■ The area will go from parking heaven to hell. Surface lots will decline over the next few years to 750 spaces from roughly 6,000 not that long ago, as massive new office, retail, and residential developments are built on them. Many of the spaces will go underground, in garages, but prices will soar and availability will be limited. The growth that’s causing traffic problems in the Seaport District “wasn’t supposed to happen until 2025,” Mayor Thomas Menino said. Menino this week gathered a collection of transportation officials and Seaport leaders in the Eagle Room of City Hall to try to address the potential choke hold on the area’s meteoric growth. Among the attendees: MBTA general manager Beverly Scott, Massachusetts Port Authority chief executive Thomas Glynn, Massachusetts highway administrator Frank DePaola, Boston Transportation Department Commissioner Thomas Tinlin, A Better City CEO Richard Dimino, and Massachusetts Convention Center Authority executive director James Rooney. “The good news is that we have this problem, if you will, that other cities would die to have,” said Glynn, who runs the airport and whose agency owns half the land in the Seaport area. The group plans to start implementing immediate fixes starting in September and spend up to a $1 million on a yearlong study to develop a comprehensive transportation plan by the end of the next year. In the short term, officials are approaching the problem by land and by sea. Ideas under consideration include directing more drivers to take the underutilized B Street tunnel to I-93; promoting bus No. 4 from North Station; opening up the Haul Road, which is restricted to commercial traffic; allowing general traffic on the downtown HOV lane on 93 North; and launching a new commuter ferry by next summer. The city and state last produced a South Boston transportation plan in 2000. That was back when a thriving waterfront district was but a dream, before a convention center, a modern museum, and so much buzz. Now as then, officials will get input from the community, residents, employers, and workers on how to improve transportation in the area. Ironically, what draws employers, restaurateurs, and residents to the Seaport District, also dubbed the Innovation District, is the myriad of transportation choices. Much of this was made possible thanks to the Big Dig in the 1990s, which gave the area a connection to the airport via the Ted Williams Tunnel and entrances to I-93 and I-90. The opening of the Silver Line in 2004 also offered a key option, and any expansion of that line could play a significant role in the district’s future success. In recent weeks, the company has been giving on-site tours for employees, in part so they can figure out commuting options. The company is encouraging workers to come by boat and use the Hubway bike system. Vertex will also operate its own bus shuttles, joining a growing fleet of private buses that ferry workers to and from points like North and South stations. There’s even one service that takes Fan Pier tenants to Downtown Crossing at lunch time so they can run errands. Glynn, of Massport, estimates officials have three years to map out solutions before congestion overtakes success. By the way the clocks run in Boston, that’s not much time. Correction: An earlier version of this story mislabeled Seaport Boulevard. The road becomes Northern Avenue after the Boston Fish Pier.